Michigan State University Press, 9780870137402, 141pp. 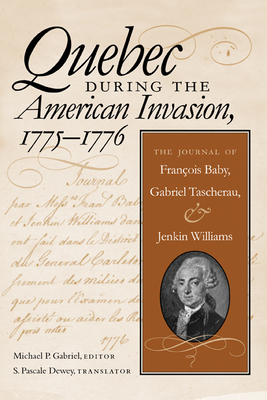 Available for the first time in English, the 1776 journal of François Baby, Gabriel Taschereau, and Jenkin Williams provides an insight into the failure to incite rebellion in Quebec by American revolutionaries. While other sources have shown how British soldiers and civilians and the French-Canadian gentry (the seigneurs) responded to the American invasion of 1775–1776, this journal focuses on French-Canadian peasants (les habitants) who made up the vast majority of the population; in other words, the journal helps explain why Quebec did not become the "fourteenth colony." After American forces were expelled from Quebec in early 1776, the British governor, Sir Guy Carleton, sent three trusted envoys to discover who had collaborated with the rebels from the south. They traveled to fifty-six parishes and missions in the Quebec and Trois Rivières district, discharging disloyal militia officers and replacing them with faithful subjects. They prepared a report on each parish, revealing actions taken to support the Americans or the king. Baby and his colleagues documented a wide range of responses. Some habitants enlisted with the Americans; others supplied them with food, firewood, and transportation. Some habitants refused to cooperate with the king’s soldiers. In some parishes, women were the Americans’ most zealous supporters. Overall, the Baby Journal clearly reveals that the habitants played an important, but often overlooked, role in the American invasion. Michael P. Gabriel is Professor and Chair of the Department of History at Kutztown University of Pennsylvania. He is also the author of Major General Richard Montgomery: The Making of an American Hero. S. Pascale Vergereau-Dewey is Professor of Modern Language Studies at Kutztown University of Pennsylvania. She is a member of the American Council for Quebec Studies (ACQS) and the Association for Canadian Studies in the United States (ACSUS), and has published widely on French Canada.